Ambulatory typically means "the ability to walk" but in the context of surgery, it refers to patients who are able to leave the hospital the same day as the surgery, without being admitted to the hospital. Ambulatory surgery is referred to by other names, commonly called minimally invasive surgery, outpatient surgery or same day surgery. When you hear someone refer to a same-day surgery, they mean an ambulatory procedure. While minimally invasive surgery is technically laparoscopic surgery, the term is often used interchangeably with ambulatory surgery. Minimally invasive procedures are surgeries that are performed using the smallest incisions possible, so that the body is able to heal more quickly. These procedures are often called "keyhole" or laparoscopic surgeries. While they are designed to decrease healing times, these procedures are not necessarily same day procedures, in fact, many require at least an overnight hospital stay. A colonoscopy is not technically a surgery, but is often referred to as an ambulatory procedure, because the patient does have anesthesia and is able to go home the same day. Most ambulatory surgery procedures are minor surgeries that do not require extended recoveries. Once the patient wakes from anesthesia and is awake and alert, if no signs of problems are present and the patient is able to urinate and pass gas, they can continue their recovery in their own home. Many dental procedures are ambulatory surgeries, such as having wisdom teeth removed. Also, quick surgeries that require small incisions, such as a carpal tunnel release, are typically done as outpatient surgeries. The typical same day surgery is usually a surgery that can be performed relatively quickly, is low risk, requires a small incision or no external incision, and has a short recovery period. Outpatient procedures are typically performed in one of two types of facilities: a hospital or a surgery center. Ambulatory surgery centers are free-standing facilities with operating rooms, but they are not hospitals. These centers perform procedures that allow the patient to recover at home once anesthesia has worn off and the patient is able to care for themselves with minimal assistance. Patients with complications that required hospitalization would be transferred to another facility for treatment when it becomes clear that they need a higher level of care. If a patient is unexpectedly too sick to go home after surgery they can transfer to the hospital for admission and care overnight or longer, depending on the patient's needs. 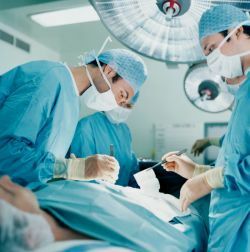 Ambulatory surgery centers typically have a relationship with at least one hospital in the community where a patient can be transferred if complications arise during the procedure or during the hours after the surgery. If you, or your loved one, had a bad reaction to anesthesia in the past, consider having surgery at a hospital. While the cost may be higher, it is important to have the full capabilities of the hospital immediately available if needed. The same is true of patients who are high risk, it is always better to err on the side of caution and not need the hospital, than need it and not have it. Patients who have a history of being difficult to remove from the ventilator should have surgery in a hospital, as should individuals with serious heart, lung and bleeding issues. Your surgeon should tell you if you are in a risk category high enough that you should have your procedure as an inpatient in a hospital, but you may still want to ask if you have any concerns. With some insurance plans there may be no cost difference between different inpatient surgery and outpatient surgery. If you are well enough to have ambulatory surgery, congratulations! Having a procedure and returning home on the same day can reduce the stress of surgery by allowing you to recover in your own home once the anesthesia wears off. Many patients prefer to recover at home, and can do so safely and without any additional complications or issues. If you have any issues that seem like they might be serious, be sure to reach out to your surgeon or seek medical attention.